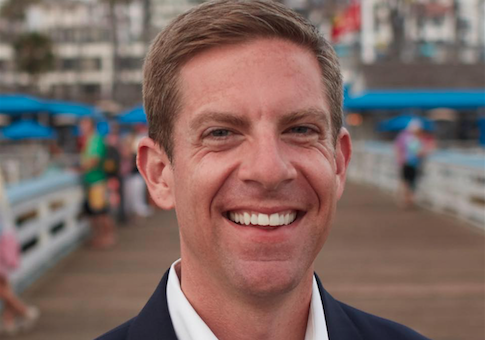 While nearly all Democrats in competitive races in the state are running away from Minority Leader Nancy Pelosi, Mike Levin is actively embracing her. Levin, who casts himself as an environmental lawyer but also served as a trial attorney for Countrywide Financial in the aftermath of the nation's mortgage crisis, is seen smiling with Pelosi in a photo during a campaign event in his district this week. "On cloud nine after meeting @TeamPelosi today at a @MikeLevinCA event," tweeted Nikki Faddick, a Levin campaign volunteer. "She singled out my @MomsDemand [action] t-shirt and said she's work across the aisle when she is again Speaker to pass GVP [gun violence protection] legislation because she knows the votes are there. Can't wait. #Flipthe49th #ExpectUs." Neither the Levin campaign nor Pelosi's campaign committee responded to a request for comment. Levin is running against Diane Harkey, a State Board of Equalization member and former state assemblywoman, in a district spanning the politically divided coastal area of north San Diego County and the far more conservative Orange County. Former Secretary of State Hillary Clinton won the district by 7.5 points in 2016, the same year Issa eked out a victory by less than 1 percent. Still, Republicans at last count held a seven-point GOP registration advantage, which is much higher in the more densely populated portion in Orange County. The congresswoman's favorability rating recently hit a nine-year low among Democrats, according to a June Gallup poll. Levin appears to be the only general-election California Democratic candidate running for a seat currently held by a Republican who is not keeping the minority leader at arm's length: many of his compatriots are either saying they will not vote for her for speaker of the House if Democrats retake the majority or declining to respond directly to such questions. The New York Daily News in March did a survey of 34 Democrats running for Congress in competitive GOP-held seats in California and found that only Levin and a defeated Democratic primary candidate running against Rep. Mimi Walters (R., Calif.) backed Pelosi. Back then, Levin unabashedly backed Pelosi for Speaker, calling her "one of my political heroes." "I can't imagine we could have a better Speaker should we regain control of the House," he told the Daily News. Levin also accepted $14,000 directly from Pelosi's PAC to the Future and personal campaign committee. Harkey, Levin's opponent, welcomed a late August endorsement tweet by President Donald Trump. "@Diane Harkey is an extraordinary woman of great accomplishment & potential She is running as a very popular Republican for the Congressional seat of my friend Darrell Issa-with his complete support. Diane is strong on crime, loves our Military & Vets—has my total Endorsement!," Trump tweeted Aug. 20. Bill Whalen, a longtime GOP strategist at Stanford University's Hoover Institution, said Levin is making the calculation that the Democrats' much touted "blue wave" in November "will be high enough to survive Nancy Pelosi" attachments. Harkey, he said, is doing the same with the Trump endorsement with both relying more on base voter turnout than swaying more independent voters. Democratic candidates this cycle had two choices when it comes to where they stand on Pelosi's continued leadership of the party, Whalen said. "One is you avoid her like the plague and dance around the issue of leadership, or you just own it—and [Levin's] clearly chosen to own it," Whalen said. Both, he said, are making the calculation that at the end of the day, there are larger frustrations for district voters that will overcome how more-independent voters feel about Pelosi or Trump. Levin also likely can't afford to alienate his big Bay-area donors who are closely allied with Pelosi. Those types of deep-pocketed political checkwriters aren't as prevalent in Orange County and other parts of the district Levin is running to represent. Campaign finance records show that just 15.3 percent of Levin's $1.8 million in donations come from within the district while nearly 70 percent come from the rest of the state, with a large portion from the Bay area. Levin's second highest contributor is Alphabet Inc., Google's parent company, which has donated $32,289 to his campaign, coming in only behind Swing Left, a liberal group, according to Opensecrets.org. In contrast, Harkey has raised a total of $702,043, mostly from district donors, along with a $100,000 loan to herself. Her largest donation was $10,800, an amount she received separately from five businesses or businessmen, at least four of which are located in the district. This entry was posted in Politics and tagged 2018 Election, Nancy Pelosi. Bookmark the permalink.